From empty lots of land awaiting your dream home to luxury homes in Kauai, the North Shore of Hawaii’s Island of Discovery offers a diverse selection of real estate for sale. Whether you’re planning to rent or purchase a new home on the island Kauai, you will want to know more about the area, including the neighborhoods and the price range of the homes for sale. Here is a look at our top three favorite neighborhoods on the North Shore of Kauai. Anini Vista: Kauai real estate on the North Shore of the island includes luxury developments in Anini Vista. Surrounded by panoramic views of the Pacific Ocean, the homes here are built on one to three acre parcels. Homeowners also have views of the Kilauea Lighthouse. Homes in this area range from $3.99 million to $9.6 million. You can also purchase vacant land from $3 million to $7 million. 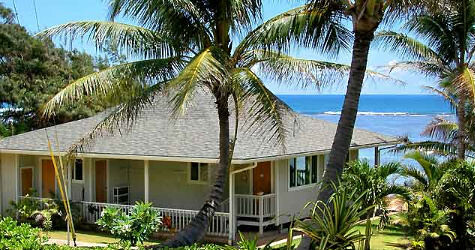 Kilauea Town: One of the most affordable locations on the North Shore of Kauai Hawaii, Kilauea Town offers old-fashioned family homes priced from $335,000 to $850,000. This area is a great place to raise a family. It offers beautiful homes in walking distance of grocery stores, schools, medical facilities, churches and community centers. The area also has plans to build a new bike trail connecting the town to Secret Beach. Seacliff Plantation: An exclusive gated community, Seacliff Plantation is located between Kilauea Town and the Kilauea Lighthouse. Homes in this area are built on five to 20 acre parcels and feature ocean or river views. Homeowners get to enjoy beautiful landscapes of rolling meadows, forested ridges and a protected bird sanctuary. Homes in this area range from $3.75 million to $7.89 million while vacant lots range from $799,000 to $2 million.